Eight years ago, I started Sandhill crane hunting. I thought it looked easy, since these birds are large. Let’s just say I got a big “goose egg” on my first 3 hunts out. How could I misjudge sandhill cranes? They measure 3- to 4-feet high and weigh 6- to 12-pounds pounds, with a wingspan of 6 to 7 feet. Yet, they are a difficult hunt for beginners. They fly fast and high. Not to be outsmarted in the field, I began researching the migration of these pre-historic birds. Cranes can fly over mountain ranges and migrate over grain fields up to 2 miles. My big question is always this one: “How do I get these birds down for a closer look of the fields so I can harvest my prize?” You’ll see how in my tips below. 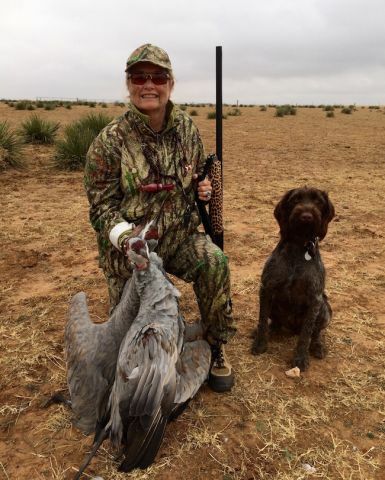 For this particular hunt, JR took shot her Remington VersaMax shotgun, custom finished in cheetah print. Now, when purchasing a waterfowl hunting license on September 1 in Texas, I include Sandhill crane, which is a free, and separate permit. I am sorry for some hunters in the Midwest and California who cannot hunt sandhill cranes migrating over their states. Or maybe not, that leaves more excitement in the field for me. I hunt for meat and filling the freezer. I am very fond of the Sandhill crane for it is delicious meat. Referred to by other hunters as “ribeye in the sky,” these birds are best prepared as if Texas beef ribeye – medium rare and seasoned with a fine rub, cooked over hot hickory charcoal. Sandhill Cranes are longest living survivors amongst birds. In fact, per the Cornell Lab of Ornithology, the earliest Sandhill Crane fossil, was dug from the Macasphalt Shell Pit, Florida, and estimated to be 2.5 million years old. They are also the most thrilling type of waterfowl to hunt. Cranes pose significant challenges and frustrations to the inexperienced hunter. Tip: Concealment! Concealment! Concealment! Sandhill Cranes have excellent vision and flare the second something doesn’t look right on the ground. Blend into natural setting by wearing face paint and being in camo from head to toe! Sandhill Cranes are notorious for not flying into feeding/hunting fields in the fog. Be patient on foggy mornings… just wait it out. When the fog burns off, the birds will be up and moving in a hurry. Tip: Sandhill Cranes fly fast and glide long distances. They are heavily bodied and produce a deep wing beat such as a greater Canada goose or swan. Lead is the key. I always suggest giving at least a school bus lead, or about 8 feet. So, what do you think? Are you ready to try sandhill crane hunting? Judy is an absolute treasure to be around. Her enthusiasm for helping other’s enjoy and experience the outdoors is second to none. I am proud to call her a friend.